Rated: R for pervasive language including sexual references. Simon Pegg and Edgar Wright have brought us a pair of films that manage to be several things at once: “Shaun of the Dead” was a romantic comedy, a zombie movie, and a coming-of-age flick; “Hot Fuzz” was a buddy cop movie, a conspiracy thriller, and a tale about finding a place you belong where you least expect it. They continue this pattern with what they’re calling the third installment in “The Cornetto Trilogy,” “The World’s End.” It’s a sci-fi thriller, a story about the difficulty of becoming an adult, and a look at the importance of friendship. Back in high school, Gary King (Simon Pegg) and his friends were an inseparable group. After graduation, they attempted a legendary pub crawl in their tiny hometown, The Golden Mile: twelve pubs, have at least one pint apiece in each. They failed to finish, and by the time the movie takes place, they’ve gone their separate ways. Gary, who’s fed up with the mediocrity he’s living, gets the idea to get the gang back together and try the crawl again – even though they’re all far older and the other four aren’t terribly interested in recapturing their youth. 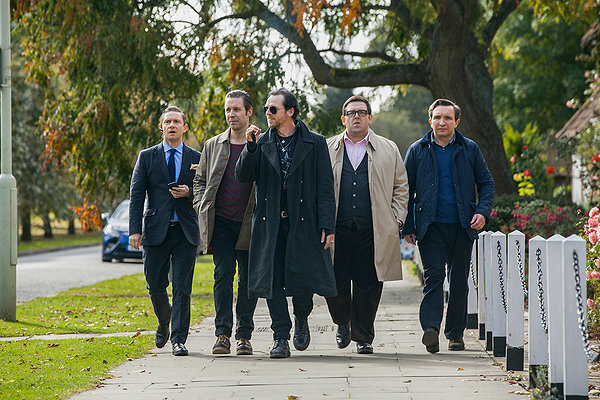 It’s impossible to argue with Gary, though, so Andy (Nick Frost), Steven (Paddy Considine), Peter (Eddie Marsan), and Oliver (Martin Freeman) find themselves piling into the same clunker of a car Gary drove back in high school and starting off at the first pub. Things are not as they remember them, even taking into account how long they’ve been away. The townsfolk seem odd. The pubs have apparently all been taken over by the same chain. Eventually Gary winds up tussling with a local teen, whose head comes right off. Turns out that “teenager” is actually a robot, and so are a lot of the townsfolk. The five friends wind up trying to stay alive long enough to get out of town – but Gary is hell-bent on finishing The Golden Mile this time, even if it gets them all killed. There are a lot of things to like about “The World’s End.” The pacing makes it work as a sci-fi thriller with a slow build, and there are plenty of laughs along the way. Gary’s attempt to recapture what he sees as the glory of their youth makes him sympathetic even as his actions show him to be a self-centered, pushy braggart. Pegg’s performance is what really sells the character, though. He gives Gary a confidence that seems thoroughly real until the façade cracks under pressure and finally collapses, and we learn why exactly he’s so determined to finish the Golden Mile. Gary’s four friends are all top notch as well. Nick Frost is pretty much always at Simon Pegg’s side in any film, and here we get to see him as a completely different character from the fellows he played in the other films. Andy has a quiet certainty and self-awareness about him that make him Gary’s opposite – and yet, we can still see why the two men used to be such close friends. Frost gives Andy a depth and gravitas that most flicks of this type wouldn’t bother with. Even better, there aren’t any cracks about his size. Frost is a big guy, but there aren’t fatty jokes here. Andy is a former rugby player and still strong and healthy – arguably even healthier than when he was younger. “The World’s End” manages to swing from heartfelt and touching to hilariously satirical in its last ten minutes, and it really works. Pegg and Wright are an incredibly talented team, and I can’t wait to see what they do next. In the meantime, I’ll pull out my DVDs of their other films to tide me over.